There are a lot of great benefits to volunteering with the Green Seattle Partnership: quality time outdoors, connecting with your community, exercise and good vibes! Sometimes there are extra perks too like free snacks and coffee, and even some giveaways. 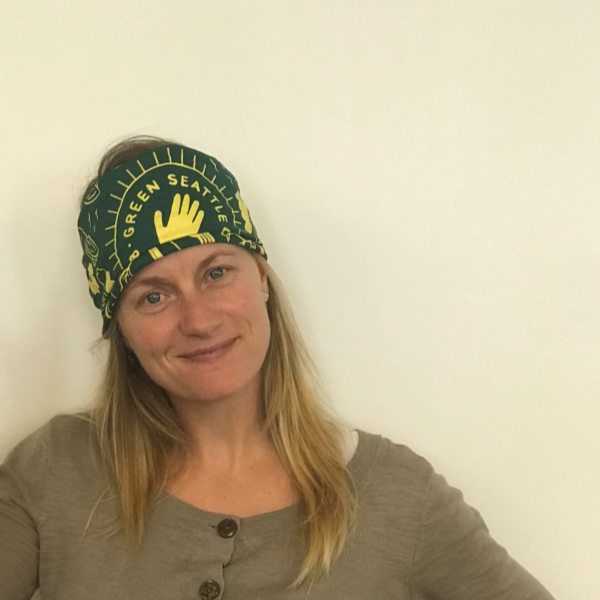 Volunteers who come out on Green Seattle Day will get a limited edition Green Seattle Day bandana! 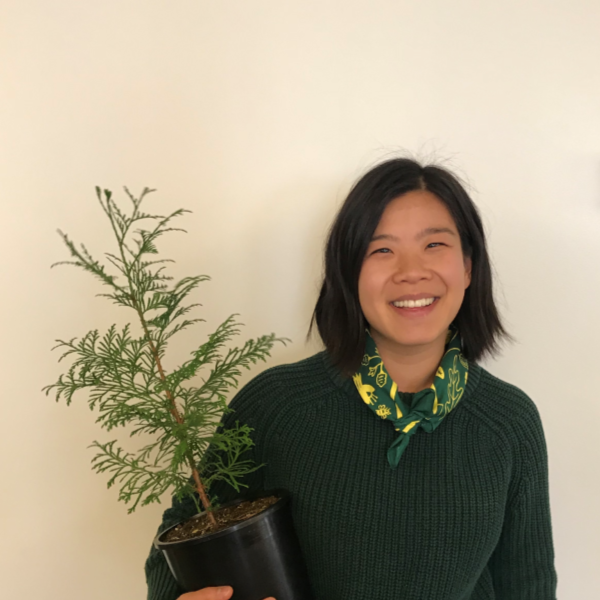 These dark green square bandanas are adorned with native plant and animal drawings from local designer Bekah Malover. We hope to see these bandanas around town and want to give you a little inspiration on how to wear yours! So scroll below to find out how you can use one bandana to create six restoration looks! Protect yourself from inhaling dusty woodchips. The “Dusty Mulch” mask is perfect to wear to a work party when the mulch is flying! 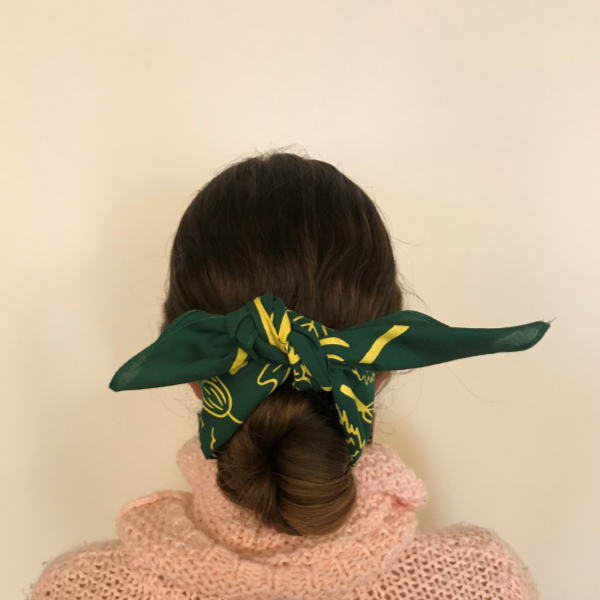 Simply fold the bandana in half so the corners touch and create a triangle; then adjust the bandana over the bottom of your face, and tie around the back of your head with a simple knot. Nothing makes you work up a sweat like going up against a wall of blackberry. This look is great for keeping hair and sweat from getting into your eyes. Fold the bandana in half so the corners touch and you create a triangle. Fold it in half again so that the point crosses over to touch the long edge. Fold in half again to create a band. Fold again for a skinnier band. Place the middle of the band on your forehead and tie a simple knot in the bandana at the back of your head. The “Forest Ranger” look isn’t just for scouts! 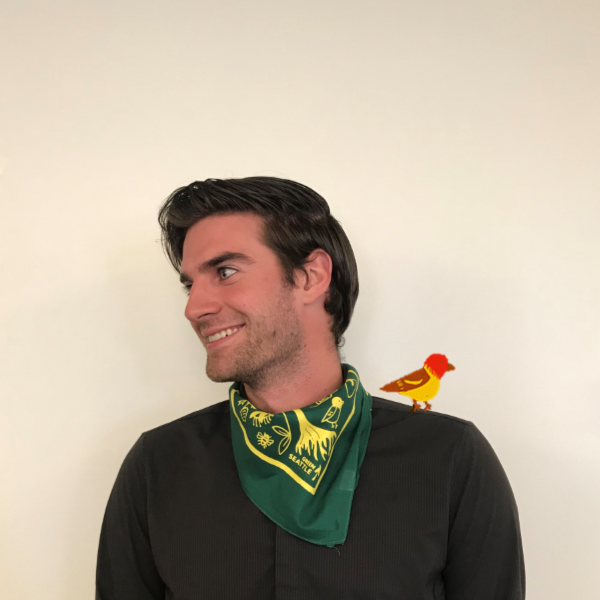 Spruce up any outdoor outfit with the classic “Forest Ranger” neckerchief. Follow the directions for the “Grubber” above to create a band. Place the middle of the band on the back of your neck and bring the two ends below your chin; tie in a simple knot. 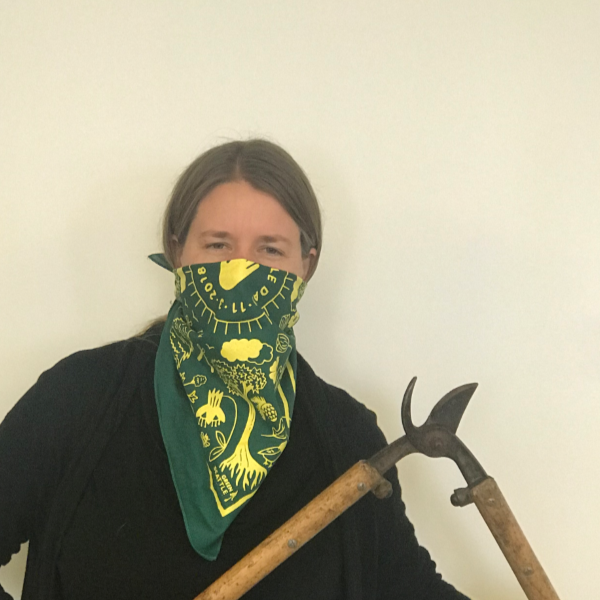 Bandits of blackberry and outlaws of the open space: Green Seattle Partnership Forest Stewards are not a group to be messed with! To rock the “Forest Steward”, fold your bandana in half by bringing two corners together to create a triangle. Fold over the long edge a time or two if you want a smaller neckerchief. Tie the two long ends around your neck and secure it with a simple knot. After volunteers plant a new native plant at Green Seattle Day, they will carefully tie a piece of flagging onto the plant so that it can be easily spotted and cared for over the next few years. The “Flagging Tape” bandana look will make your hair-do hard to miss! Who runs the world? Girls! Girls! 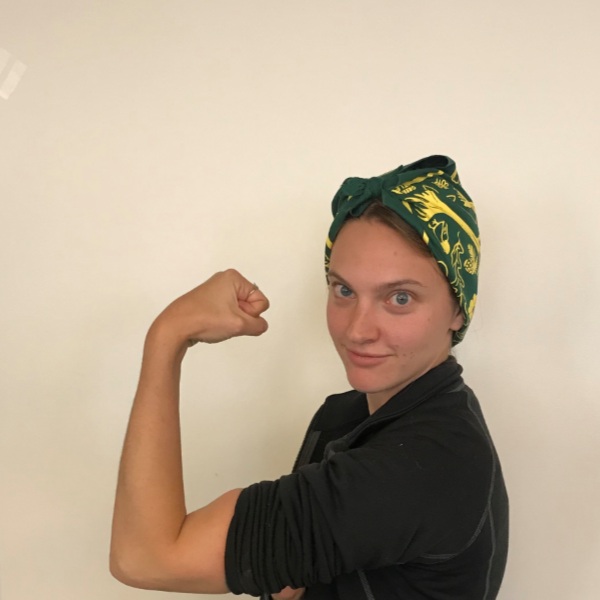 Channel your Rosie the Restoration Riveter with this bandana up-do. Create a triangle by folding your bandana in half. Put the long folded edge at the base of your neck and pull up the two opposite ends and tie in a bow at the top of your forehead. Take the loose point and tuck it under your knot. Adjust extra fabric by tucking the bandana in where possible. 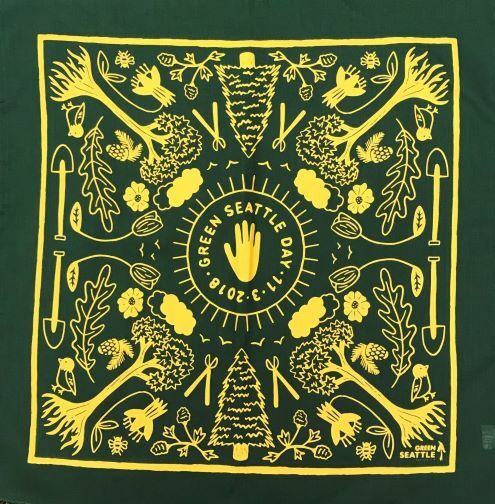 Show us your Green Seattle Day bandana stylings with #GSDBandana. Didn’t register for Green Seattle Day? Don’t worry there are still spots left at a few parks- register today!